[author (last name first)]. 2006. 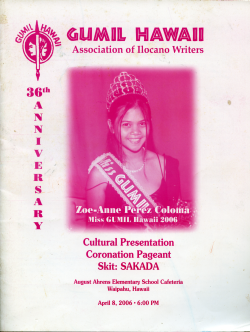 [story/poem/essay title] GUMIL Hawaii: 36th Anniversary 2006 Souvenir Program, [pages]. Pacita C. Saludes and Brigido Daproza, editors. Honolulu: GUNIL Hawaii. http://www.efilarchives.org/pubications (accessed [date of download]). Souvenir booklet of the 36th anniversary of GUMIL Hawaii celebration. Event includes cultural presentation, coronation pageant for Miss & Mrs. GUMIL Hawaii, and a drama presentation (SAKADA). Event took place on April 8, 2006, at August Ahrens Elementary School Cafeteria, Waipahu, Hawaii.